SAN JOSE — Japantown celebrates the San Jose Obon festival, a time when generations of families and friends come together and enjoy a rich cultural experience in one of the three remaining Japantowns in the United States. 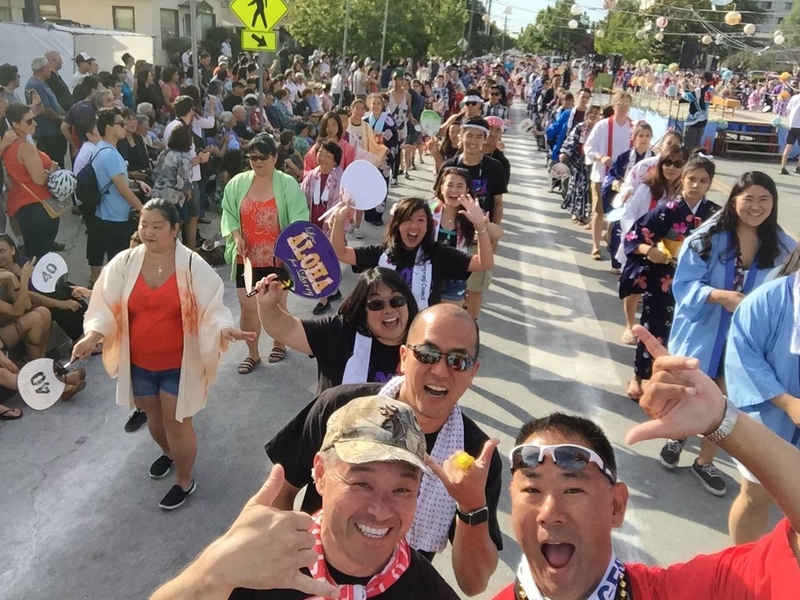 Japantown’s largest festival features two days of game booths, food booths, the Chidori Band, three taiko performances each day, including San Jose Taiko. and over 1,200 dancers in colorful traditional festive wear each evening. Festivities will take place at San Jose Buddhist Church Betsuin, 640 N. 5th St., on Saturday, July 9, from 12 to 10 p.m. and Sunday, July 10, from 12 to 8 p.m.
Head dance teacher is Hanayagi Reimichi (Reiko Iwanaga). Assistant teache are Bando Musashizu (Lynne Yamaichi), Eileen Sera, Diane Tsukamoto Hurd, Karen Akimoto, Gail Iwasaki, Judy Santo and Curtis Takahashi. Dances to be performed and props needed for each are: “Shinshu Ondo” (uchiwa), “Obon no Uta” in memory of Cindy Iwamura (uchiwa), “Oyama Ondo” (kachi kachi), “Kawachi Ondo” (hands), “Wonderful Ondo” (fan/uchiwa), “Pokemon Ondo” (hands), “Janken Ondo” (hands), “Hinokuni Daiko” (towel), “Shiawase Samba” (hands), “Chidori Band Ondo” (fan/uchiwa), “San Jose Bayashi” (uchiwa), “Ei Ja Nai Ka” (hands), “Hanabo Ondo” (hands), “Tanko Bushi” (hands), and “Obon no Uta” (uchiwa). Menu items in the food court include strawberry shortcake, ramen, sushi, chicken teriyaki, Imagawayaki, gyoza, tempura, beef teriyaki, boba tea, iced mocha, iced tea, beer and sake. Games for kids: Add-Em Up, Basketball, Bear Toss, Color Spot, Golf, Grab Bag, Hi-Lo, Hoop-La, Milk Can, Nickel Pitch, Pick a Lantern, Ping Pong Toss, Ring Toss, Tic Tac Toe, Treasure Chest and Whiffle Toss. Visit the Generations (http://generations.sjbetsuin.com) booth in front of the Hondo. Generations is $10 million capital campaign project with two building phases over five years. Phase 1 addresses seismic concerns with the Annex Building and represents approximately one-third of the financial target. Annex renovation is expected to be completed before the 2016 Obon. Phase 2 focuses on the Education Building and is expected to be fully funded by 2019. The goal is to build a thriving Betsuin for future generations to enjoy for years to come. Free parking in county lot on 1st Street between Younger and Hedding, with parking lot security and free shuttle bus transportation on Saturday from 11 a.m. to 11 p.m. and Sunday from 11 a.m. to 10 p.m. For those able to walk, the distance is six blocks from the festival. For more information on the festival, call (408) 293-9292 or visit www.sjbetsuin.com.